Delta is really fighting for their amazing on-time record, when Hurricane Irma was bearing down on San Juan a Delta flight braved the storm and managed to land and take off all under an hour. Hurricane Irma was an amazingly powerful storm that ripped all through the Caribbean destroying islands and causing damage everywhere it went. This hurricane had winds peaking over 140 miles per hour that destroyed everything in its path. One Delta flight braved these winds to get into San Juan to pick up one last load of passengers right as the storm was hitting. 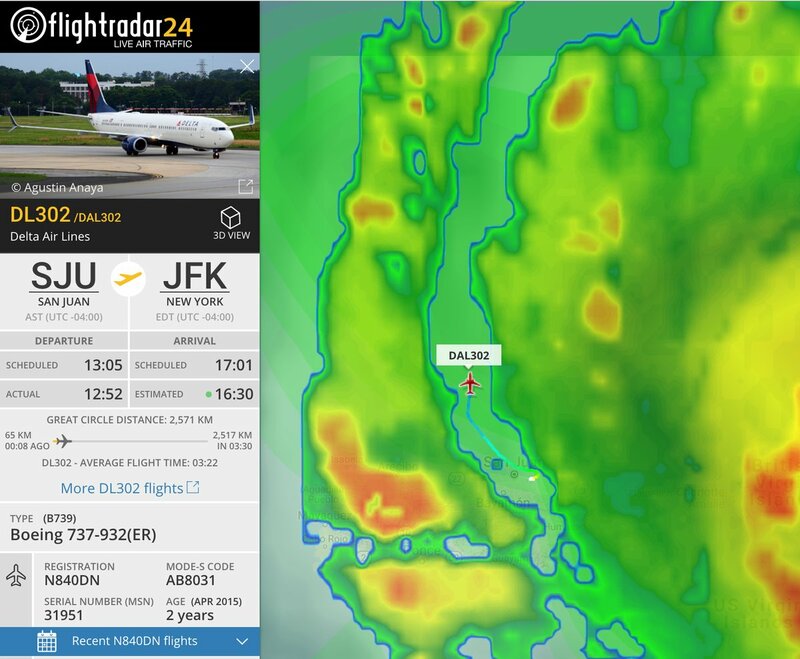 Information provided by FlightRadar24 shows that the Delta flight dodged the outside of the storm to land, turned the flight around in less than an hour and took back off minutes before the storm beared down on the island. Delta was the only airline to fly into the island right when the storm was about to hit. Other airlines either retroactively canceled flights or diverted to other airports out-of-the-way of the storm. This was an amazing move by Delta to fly into the island and take the risk of not being able to make it out. If this Delta flight didn’t manage to get out of the island and got stuck it would surely be the end of that plane. With how powerful the winds were the plane would be destroyed by flying debris. Congratulations to Delta for managing to get a flight in and turned around so quickly, going places that no others will go, and to the extreme. While it may have been scary being so close to the storm Delta may have saved some lives by getting them out-of-the-way of the storm. Next articleWhat Important Papers Should You Take With You During An Evacuation?